jDepartments of Pediatric Radiology (R.C., A.P. )lDepartment of Biomedical Informatics (R.C. ), University of Pittsburgh, Pittsburgh, Pennsylvania. BACKGROUND AND PURPOSE: Abnormal cerebral microstructure has been documented in term neonates with congenital heart disease, portending risk for injury and poor neurodevelopmental outcome. Our hypothesis was that preterm neonates with congenital heart disease would demonstrate diffuse cerebral microstructural abnormalities when compared with critically ill neonates without congenital heart disease. A secondary aim was to identify any association between microstructural abnormalities, white matter injury (eg, punctate white matter lesions), and other clinical variables, including heart lesions. MATERIALS AND METHODS: With the use of tract-based spatial statistics, an unbiased, voxelwise method for analyzing diffusion tensor imaging data, we compared 21 preterm neonates with congenital heart disease with 2 cohorts of neonates without congenital heart disease: 28 term and 27 preterm neonates, identified from the same neonatal intensive care unit. RESULTS: Compared with term neonates without congenital heart disease, preterm neonates with congenital heart disease had microstructural abnormalities in widespread regions of the central white matter. However, 42% of the preterm neonates with congenital heart disease had punctate white matter lesions. 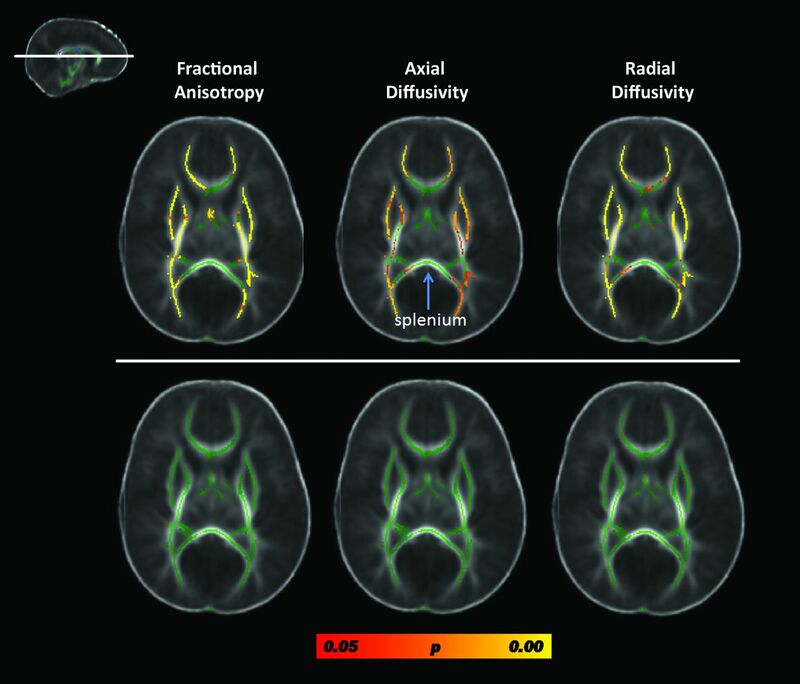 When neonates with punctate white matter lesions were excluded, microstructural abnormalities remained only in the splenium. Preterm neonates with congenital heart disease had similar microstructure to preterm neonates without congenital heart disease. CONCLUSIONS: Diffuse microstructural abnormalities were observed in preterm neonates with congenital heart disease, strongly associated with punctate white matter lesions. Independently, regional vulnerability of the splenium, a structure associated with visual spatial function, was observed in all preterm neonates with congenital heart disease. Prematurity and CHD are independent risk factors for adverse neurodevelopmental outcome, and it follows that having both further increases the risk. Prior studies of term neonates with CHD have also documented delayed brain maturation, particularly in term infants with single ventricle physiology, further increasing their risk for injury or adverse neurodevelopmental outcome.9–15 Thus, examining the cerebral microstructure of preterm infants with CHD in relation to prematurity and injury may provide important insights into the complex combination of risks portending adverse neurodevelopment in infants with CHD. To date, few neonatal neuroimaging studies have been described in preterm infants with CHD. In the present study, we used DTI to investigate the microstructural integrity of the cerebral white matter and select gray matter regions in preterm neonates with CHD. Our hypothesis was that preterm neonates with CHD would demonstrate diffuse cerebral microstructural abnormalities at near term-equivalent age when compared with other critically ill neonates without CHD. Our secondary aim was to identify any association between microstructural abnormalities, documented patterns of white matter injury, and other pertinent clinical variables, including the complexity of the heart lesion. We included 2 separate comparison groups: term neonates without CHD and preterm neonates without CHD, both of which were identified from the same high-risk neonatal intensive care unit. The term neonates without CHD allowed us to determine whether the microstructure in our preterm neonates with CHD differed from “normal” at term-equivalent age. The preterm neonates without CHD allowed us to determine whether the presence of a congenital heart defect resulted in further microstructural abnormality than would be accounted for by prematurity alone. Finally, by separating our preterm neonates with CHD into the subset with punctate white matter lesions (pWMLs) and those without pWMLs, we were able to directly address whether the microstructural abnormalities were related to cerebral white matter injury. Target Cohort of Preterm Neonates with CHD. Neonates undergoing clinically indicated brain MRI at near term-equivalent age during the period of 2005–2010 were recruited as part of ongoing longitudinal studies of neurodevelopment in neonates with prematurity and CHD at a single institution. In the preterm CHD group, we included neonates with any heart anomaly treated surgically, including atrial septal defect, ventricular septal defect, patent ductus arteriosus requiring surgery after term equivalency, hypoplastic left heart syndrome, Ebstein anomaly, coarctation of the aorta, truncus arteriosus, transposition of the great arteries, and double-outlet right ventricle (Table 1). Patients with CHD were excluded if 1) the heart anomaly did not require surgery; 2) they had a chromosomal abnormality; 3) the brain MR imaging did not include DTI data that were analyzable (ie, caused by motion artifact or technical factors); and 4) there was a congenital brain malformation or a significant brain abnormality/injury, which could distort subsequent DTI measurements. Given the diversity of heart lesions treated by surgery in the preterm CHD group, the clinical data (including fetal echocardiograms) for the preterm CHD cases were reviewed by 3 pediatric cardiologists (J.D.P., R.G.W., J.A.D.) for determination of heart lesion complexity (see more details in On-line Appendix). Comparison Cohorts of Critically Ill Term and Preterm Neonates without CHD. All imaging was obtained in a 1.5T system (GE Healthcare Medical Systems, Milwaukee, Wisconsin) with a neonatal head coil and neonatal incubator (if clinically necessary). The following imaging sequences were acquired: T2WI FSE in axial and coronal planes (TE/TR = 85/5000 ms, FOV = 20 cm, matrix = 320 × 160 or 256 × 128, section thickness, 3 mm, spacing = 0) (5 minutes); coronal T1 3D spoiled gradient-recalled echo (TE/TR = 6/25 ms, FOV = 18 cm, matrix = 256 × 160, section thickness = 1 mm, spacing = 0) (10 minutes). The DTI protocol included an EPI sequence with the following parameters: TE/TR = 80/10,000 ms, FOV = 22 cm, matrix = 128 × 128, section thickness = 4.5 mm, spacing = 0, with an in-plane resolution of 1.7 mm applied along 25 noncolinear directions with a b-value of 700 seconds/mm2 (6 minutes). All standard MR images were reviewed by 2 independent readers (J.L.W., A.P.) for the presence of pWMLs, used here as a MR imaging biomarker for noncystic periventricular leukomalacia (Fig 1). Consensus was achieved if there was disagreement. Infant with hypoplastic left heart syndrome born at 31 weeks postconceptional age and imaged at 35.5 weeks postconceptional age. Three coronal cuts from the 3D T1-weighted spoiled gradient recalled echo sequence demonstrating punctate T1-hyperintense lesions (circled in red) in the periventricular white matter and corona radiata just rostral to the genu of the corpus callosum (left), at the level of the pre- and post-central gyri (middle), and posterior to the trigone of the lateral ventricle (right), consistent with bilateral pWMLs or periventricular leukomalacia. DTI data analysis was performed by using FSL software (Version 4.1.4; http://www.fmrib.ox.ac.uk/fsl)25. Our protocol for tract-based spatial statistics (TBSS) was similar to other published methods previously optimized for the neonates.26 (Please refer to On-line Appendix for more detail about TBSS methodology). Continuous clinical variables were compared by use of a 3-way ANOVA. Pair-wise comparisons were then made by means of Tukey analysis. Categoric clinical variables were compared by means of Kruskal-Wallis or χ2 tests, as appropriate. Differences in perioperative variables were determined by nonparametric tests. R Developmental Core Team (http://www.r-project.org/) and SPSS (Version 19; SPSS, Chicago, Illinois) were used for all statistical analyses. There were 76 cases that met the inclusion criteria for this study: 21 preterm neonates with CHD, 28 neonates born at term (≥37 weeks; term comparison group), and 27 neonates born between 23–36 weeks gestational age (preterm comparison group). There were no significant differences in postconceptional age (defined as gestational age at birth plus postnatal age) at time of MR imaging among the 3 groups, including the subset of preterm CHD cases identified with pWMLs (P = .58, ANOVA). Information regarding diagnosis, clinical course, MR imaging, and surgical variables for preterm CHD cases are summarized in Tables 1⇓–3. On the basis of conventional MR imaging, pWMLs were found in approximately 42% of the preterm CHD cases (κ score = 1.0) (Fig 1). Of the CHD cases with pWMLs, 63% had MR imaging performed in the postoperative period. The most common heart lesion in the preterm neonates with CHD with pWMLs was hypoplastic left heart syndrome (n = 4; 1 preoperative; 3 postoperative). The other diagnoses associated with pWMLs included 1) Ebstein anomaly (n = 1, preoperative); coarctation (n = 1, postoperative); ventricular septal defect (n = 1, preoperative); and double-outlet right ventricle (n = 1, postoperative). The highest number of pWMLs was noted in 2 hypoplastic left heart syndrome cases and a coarctation case. We compared clinical variables between the preterm neonates with CHD and pWMLs and the preterm neonates without CHD, and the only statistically significant difference was the relatively increased use of inotropes (P < .02) (Table 2). We also compared multiple perioperative variables between the preterm CHD cases with pWMLs and the preterm CHD cases without pWMLs and found that pWMLs were associated with earlier age at surgery (P < .05) (Table 3). Compared with the term neonates without CHD, the preterm neonates with CHD were found to have significantly reduced fractional anisotrophy (FA) in focal regions of the posterior cerebral white matter. This included key regions caudally within the developing visual system (ie, optic radiations and the splenium of the corpus callosum) with relative sparing of the more rostral visual areas (ie, the inferior frontal-occipital fasciculus) (Fig 2, top row; and On-line Appendix Fig 2). There were fewer significantly reduced FA voxels seen in the developing limbic system (ie, fimbria and fornix) and the posterior body of the corpus callosum. There was relative sparing of the developing motor system (ie, posterior limb of the internal capsule and cerebral peduncle). 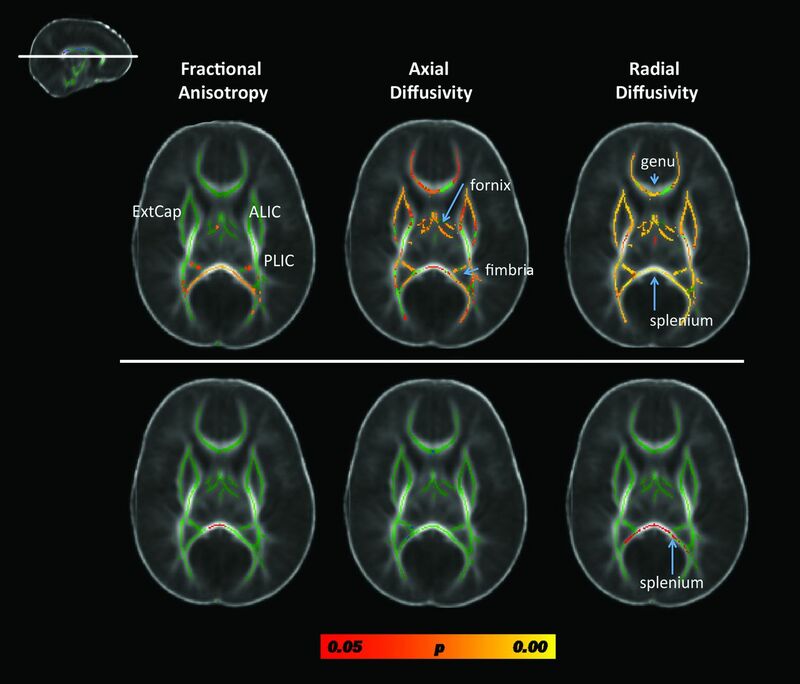 Results from the whole-brain, voxelwise TBSS analysis contrasting fractional anisotropy, axial diffusivity, and radial diffusivity metrics between preterm patients with CHD and term neonates without CHD, controlling for postconceptional age. Results from a single cut at the level of the genu and splenium of the corpus callosum are displayed (see inlay in the upper left). The top row includes data from comparing all preterm CHD cases to the term neonates without CHD. Diffuse microstructural abnormalities are seen in nearly all white matter regions. The bottom row includes data from comparing only the preterm CHD cases without pWMLs with the term neonates without CHD. The only structure showing micotructural abnormality is the splenium. Voxels showing a significant reduction in FA and axial diffusivity and a significant increase in radial diffusivity are shown in red-yellow, with the color bar denoting statistical significance, corrected for multiple comparisons. Note that most of the group differences are due to the cases with pWMLs or periventricular leukomalacia. ExtCap indicates external capsule; ALIC = anterior limb of the internal capsule; PLIC = posterior limb of the internal capsule. In contrast with the FA results, changes in diffusivity, including increases in both axial diffusivity and radial diffusivity, were observed in widespread cerebral white matter regions in the preterm neonates with CHD (Fig 2 and On-line Appendix Figs 3 and 4). There was involvement of all neural systems noted including both rostral and caudal visual areas, the limbic system, the motor system, and frontal lobe regions (Fig 2 and On-line Appendix Figs 3 and 4). To examine whether the differences in the DTI metrics of brain microstructure above reflected maturational differences, we excluded the preterm CHD cases with pWMLs and compared the remaining preterm CHD cases (n = 13) to the term neonates without CHD. In this analysis, most of the diffuse microstructural differences disappeared except for persistent decreased FA and increased radial diffusivity in the splenium (On-line Fig 2, bottom row). In contrast to the results for the comparison between the patients with CHD and the term comparison group, there were far fewer differences in the white matter of the preterm patients with CHD relative to preterm neonates without CHD. In the analysis corrected for multiple comparisons, no significant differences were detected for FA or any of the diffusivity metrics. To address whether there were maturation differences between the preterm neonates with CHD and the neonates without CHD, we repeated the above analyses while excluding the preterm neonates with CHD with pWMLs. Notably, no significant differences were detected in any brain region for any DTI metric in either the corrected or uncorrected data. TBSS Analysis: Complex CHD Preterm Cases Compared with Other Heart Lesions. We compared complex preterm CHD cases (hypoplastic left heart syndrome, transposition of the great arteries, and Ebstein with significant valvular disturbance) with the other preterm CHD anomalies (atrial septal defect, ventricular septal defect, patent ductus arteriosis, coarctation, double-outlet right ventricle with subaortic ventricular septal defect). There were diffuse microstructural abnormalities, including decreased FA and increased axial diffusivity and radial diffusivity in widespread white matter regions, in the single-ventricle physiology cases compared with the other CHD cases (Fig 3, top row). However, when the analysis was corrected for the number of pWMLs, no differences were detected between these 2 groups (Fig 3, bottom row). Of note, there was relative sparing of the corpus callosum, including the splenium, suggesting that splenium was microstructurally similar between the 2 preterm CHD groups (Fig 3). Similar results were also obtained when the hypoplastic left heart syndrome and transposition cases were grouped together and compared with all of the other heart lesions (data not shown). Results from the TBSS analysis contrasting FA, axial diffusivity (AD), and radial diffusivity (RD) in preterm patients with CHD with complex CHD lesions compared with preterm patients with CHD other heart lesions. Results from a single cut at the level of the genu and splenium of the corpus callosum are displayed (see inlay). The top row depicts the results of the contrasts between the preterm neonates with complex heart lesions relative to the preterm neonates with other heart lesions; the bottom row depicts the results from the contrasts of the same cases after correction for number of pWMLs. Both analyses are corrected for postconceptional age. Voxels showing a significant reduction in FA and AD and a significant increase in RD are shown in red-yellow, with the color bar denoting statistical significance, corrected for multiple comparisons. Of note, there is no difference in DTI metrics values in the splenium of the corpus callosum (arrow) between heart types. Consistent with prior studies of CHD, the highest incidence of pWMLs and concurrent microstructural abnormalities was found in the infants with hypoplastic left heart syndrome. It is well established that these infants are at exceedingly high risk for maturational delay and perinatal brain injury owing to the complex factors associated with abnormal uterine brain development and abnormal cerebral perfusion.10,11,32 However, not all of the infants with hypoplastic left heart syndrome have significant long-term neurocognitive problems, and initial results from the multicenter single ventricle reconstruction trial indicate that early neurodevelopmental outcome is more highly associated with innate patient variables than with intraoperative management strategies.33 In this analysis, there were no differences in microstructure between the neonates with complex CHD and neonates with other congenital heart lesions after correcting for the number of pWMLs. It is possible that pWMLs or associated microstructural abnormalities at the neonatal time period will be able to further distinguish among the infants with hypoplastic left heart syndrome, who are at highest risk for specific adverse neurodevelopmental outcomes. It could be suggested that we should have focused on the major left-sided heart lesions and excluded infants with other lesions such as atrial septal defect or ventricular septal defect due to marked differences in the hemodynamics in these neonates both in utero and postnatally.32 However, the incidence of hypoplastic left heart syndrome among preterm infants is relatively rare and we did not have sufficient sample size to include these lesions alone. A second limitation in this study is the inclusion of cases with MR imaging scans performed preoperatively and postoperatively. Third, there is the potential for sampling bias as we relied on clinical scans to identify our neonates before induction. Fourth, our study sample size was small and recruited from a single institution. Our study provides evidence that preterm neonates with CHD demonstrate diffuse microstructural changes in central white matter tracts when compared with other critically ill neonates without CHD. However, these microstructural changes are highly associated with the occurrence of pWMLs, a biomarker for noncavitary periventricular leukomalacia. Regardless of injury, a persistent microstructural abnormality was noted in the splenium, which could explain the high prevalence of visual-spatial neurocognitive dysfunction in surviving patients with CHD. This study suggests that MR imaging may not only have a beneficial role in identifying preterm infants with CHD who are at the greatest risk for adverse neurodevelopmental outcome, but also may be a clinical biomarker to help guide potential neuroprotective or rehabilitative therapies in this population. The authors thank Julie Castro, Anita Hamilton, and Hesham Mahmoud for their assistance with patient recruitment and data management. We also thank Drs Hannah Kinney and Dr Istvan Seri for careful review of the manuscript. We thank Melanie Gieraltowski for manuscript preparation. L.B. Paquette and J.L. Wisnowski are co-first authors. Disclosures: RELATED: Grant: NINDS (listed under grant funding)* (*money paid to institution). Support for this study is provided by the National Institutes of Health: K23NS063371 to A.P., P50NA019632 to J.L.W., 1UL1RR031986 to A.P., J.L.W., and L.B.P., K12HD052954 to J.A.D. ; and Rudi Schulte Foundation to S.B. Accepted after revision January 8, 2013.